Your guild is fighting against others for survival and power. Your goal is to expand your guild's territory and hold on to it, to level up your guild and gain bonuses and glory for all its members. Each day in GvG your guild must conquer new sectors and defend the sectors it already has under its control. At the end of every day (when the countdown timer ends), guilds' experience is calculated according to the territory they own, and this experience contributes to the guild's level. Level up your guild to gain better rewards! To get involved in the action, you need to be part of a guild. No matter your guild's size, if you are in Iron age or above, you can still participate. GvG battle gives battle points, too, so you don't need to make a choice between towers or GvG. GvG is only available in the desktop version of the game. All action takes place via the GvG continent map, which is a special map designed for inter-guild battles and warfare. The map is split up into provinces, which you can see are separated by rivers and mountain borders. All but one of the provinces represent an era - the bottom-most one is a special “All Ages” province. The GvG continent map allows you to see a quick overview of your guild's influence in different provinces and also serves as the entry point into those provinces, where your guild will do battle. In the image below, you can see your own guild's area of influence highlighted in green, with enemy territory shown in red. Orange areas indicate territory which is owned by NPCs, in which player guilds have yet to expand. Your guild can fight in a single province, or all of them... the choice is yours! However, when fighting in one of the era-specific provinces, you can only do battle using units and goods from the same age as the province you are fighting in... so, for example, in the Iron Age map, you can only use units and goods from the Iron Age. At the bottom of the map there is a smaller, special “All Ages” province. In this province you can use units from any era in your battles. You cannot use goods on this map - the siege costs, as well as the costs for placing defending armies, can only be paid with medals. The battles are fought in the province map. With the help from your guild mates you lay seige to a sector, and then attack it. The province map consists of sectors, which are represented by hexes. It is your guild's job to conquer these sectors - and defend them from invasion - in order to expand your territory. 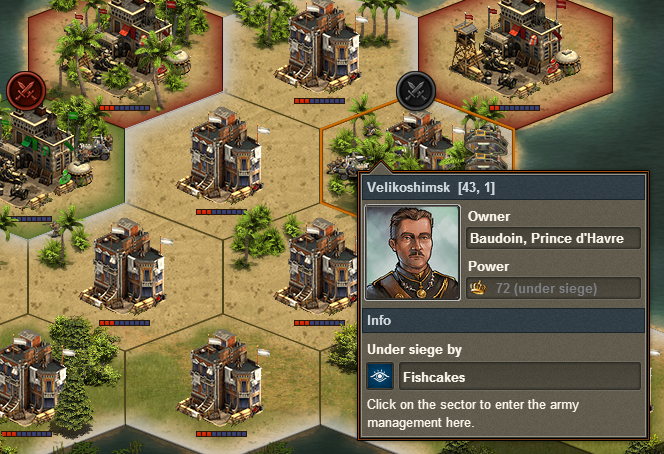 There are two stages to conquering a sector: first you lay seige and then you must attack! When you open the Guild province map for an era, you will notice that some of the map is dark, which indicates unexplored, unclaimed territory. The active area is where you can land your first army and establish your guild's headquarter. When you initially enter a province map, you are able to place a siege army in any of the sectors in the landing zone (white area), or on a river sector next to or in another guild's area. The rest of the hexes still belong to the NPCs but can only be attacked if you control an adjacent hex. You can see in the map above if a sector is under siege, as it has an icon with crossed swords above it. A shield icon above a sector means that the sector is protected, as it was recently conquered and cannot currently be attacked. Protected sectors also do not count for attacking and placing siege armies. This means that if you only have one, protected sector next to an enemy sector you want to attack, you will need to wait until the protection is lifted from your sector before you are able to deploy your siege army there. 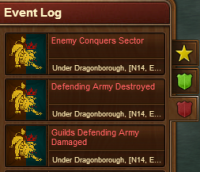 The event log records actions made by your own guild members and enemy guilds. You can access it from the province map by clicking the event log button in the menu at the bottom left of the screen. Clicking on a tab in the event log will show a list of recent events and where the event took place. Clicking the log entry will center the map on that area. You can view information about a sector by hovering your mouse over it in the province map. When you control a sector, you gain "power" which you can see in the sector's information. Different sectors provide more or less power and, as you gain power, this converts to experience points for your guild, which are used to increase your guild level. 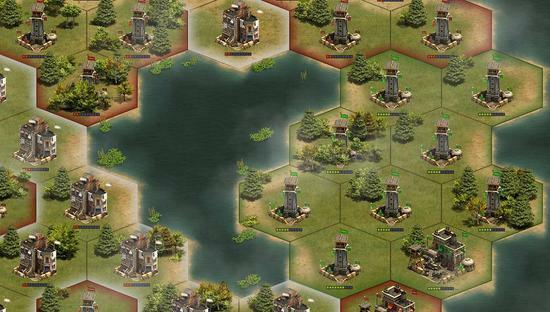 The white color of the hex in the image indicates that the sector is controlled by a NPC. You can also see the guild's co-ordinates (handy for communicating strategies with your guild members! ), power, and if the sector is under siege, information about the besieger is also displayed. When you click on a sector, the options displayed depend on whether the sector belongs to your guild, if an enemy guild controls it, or an NPC (in which case no options are shown). Pictured is an example of sector options for one of your own guild's sectors. Clicking the Profile option will take you to your guild's profile, and Guild in Ranking will bring up the Guild Ranking screen. Every day, your support pool bonus is applied first to your HQ, which gets the strongest bonus, and then to adjacent sectors, spiraling outwards. This makes your HQ a strategic center which your guild may wish to relocate on occasion. Clicking the Relocate HQ button will move your HQ to the chosen location, but this can only be done once per day. Note that the support pool bonuses for sectors will not change until the next daily calculation. 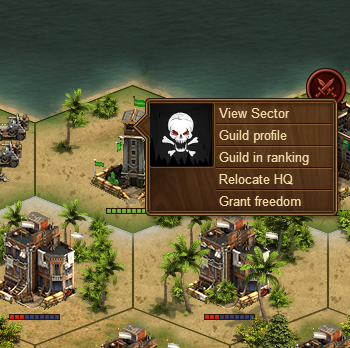 If a sector is no longer strategically useful for your guild, you can choose to grant it freedom. This will result in the sector becoming controlled by an NPC, and a goods payout will be made to your guild treasury, which is based on the territory owned by your guild, and the number of siege armies it has placed. Remember that each "trusted" player can only grant freedom to four sectors per day. Enter an enemy sector by clicking its hex and selecting the "view sector" option (skipping the "view sector" option when entering an NPC-controlled sector), and this will take you to the army management screen. At the top right of the screen is a space where you can deploy armies to the sector. There are two possible options for deploying armies: siege army (if you don't own the sector), and defense armies (if you do). As we are trying to conquer the sector, in this case you would want to deploy a siege army. Before you can begin attacking, you first need to stake a claim to the sector you want to conquer. Deploying your guild's first siege army costs goods, and the amount required which is shown when you hover over the deployment button. 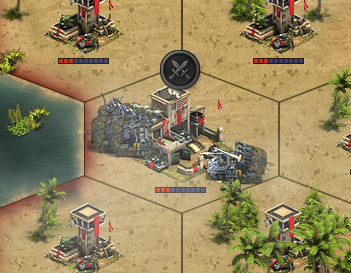 Once you have laid claim to the sector you want, and deployed your siege army, the attacks can begin to conquer it! One single attack is unlikely to be enough and it may take many successive attacks to gain control of a sector. You need to use your own army to attack... you cannot attack with the siege army. 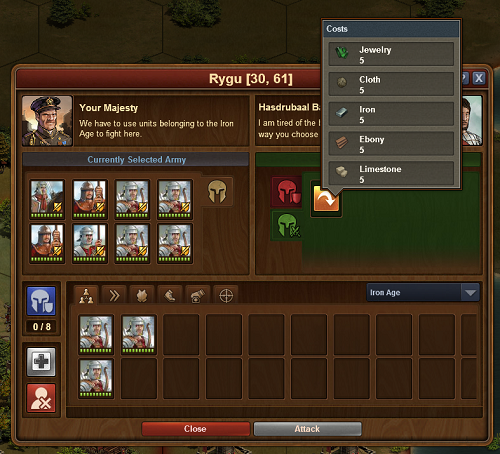 Click the red defensive icon in the army management screen to view your enemy's defensive armies. It's possible to have up to 8 armies defending a sector, and you need to defeat them all to gain control of the sector. In this case there are two defending armies. Each time you attack, your army will fight against a random defending army (you cannot choose which army to attack). Below the army's icon, you can see the army's health bar. The armies in the picture have 8 and 9 health respectively, which means they need to be defeated 17 times total in battle to be utterly destroyed and removed from your opponent's defending armies. Beware - you need to defeat each army multiple times for it to be completely destroyed. When you have killed all of your opponent's defending armies, your siege army moves in and becomes the sector's first defending army. You may find that another rival guild has laid claim to a sector you want or that belongs to your guild, and placed a siege army there. All is not lost! You can attack and destroy your enemies' siege armies in much the same manner as you destroy defending armies. After you have gained control of a sector, it is protected from attack for a period of time, until the end of the "day", which is indicated by a countdown timer at the top left of the province map. When the countdown reaches zero, the day ends and scores are calculated for the previous day. The protection is also lifted. It's in your interests to hold on to a sector until the timer runs out! Every day when the countdown runs out, scores are calculated for the previous day. You need to be holding on to a sector when the timer runs out for it to count! So, it's in your interests to hold on to a sector for as long as you can, or at least until the timer reaches zero. When you conquer a sector you start with only one defending army (which was formerly your siege army). You can place up to seven additional armies in the empty slots, making a total of eight. But you need to pay goods to unlock each army slot, and the cost increases with every slot you unlock. As with siege armies, units deployed to defensive armies belong to your guild and cannot be retrieved. As the cost of goods rises, a single person may no longer be able to afford to unlock slots, and so goods contributing to unlock slots go into a guild treasury, which holds goods until they are ready for use. When one of your sectors is under siege by an enemy, the sector will not produce power. Most actions are also blocked (placing a defending army, relocate HQ or grant freedom). So, it's in your guild's interest to kill off any armies that are besieging your sectors. Every guild has a "support pool", which gives bonuses in GvG warfare. A guild's support pool is calculated from the guild's level and certain buildings that its members have. It gives a percentage bonus to the attack and defense of all units of that guild in this sector. The support pool is distributed among sectors controlled by a guild, with the guild HQ taking precedence, before adjacent sectors receive a bonus, and then sectors further away after that. You can see a support bonus by hovering your mouse over an army. Defending armies and siege armies can have a support bonus if they are in range. A guild's support pool is recalculated every day, when the countdown ends. HINT: Your guild HQ has the highest support bonus, reducing the further away you get from your HQ. Attack protection on sectors is lifted. If you have relocated your HQ the previous day, the relocate option is reset and you are again able to move your guild headquarter. Leveling up your guild will improve its ranking and give bonuses to all its members. Some bonuses will help your guild in the GvG maps, and there are also player bonuses to be gained. You can view information about your guild’s level, and requirements for all levels, in the guild level window, which is accessible from your guild menu icon. To see rewards and requirements, you can scroll through the levels using the arrows at the bottom of the guild level window. In order to level up your guild you need to gather power. You gain power by acquiring and holding onto territory. Every sector you control gives power and, at the end of each day, your guild's power points are calculated and added to your guild's total, which contribute towards leveling up your guild. Player bonuses - Some levels will also provide a player bonus. Recruitment boost - Reduces the time needed to recruit units (new times are shown in the recruitment screen), and healing times for units. Research boost - Gives additional Forge Points each day in your town hall. Construction rebate - Reduces coin and supply cost of all buildings by a percentage (the original cost is shown in the research tree, and the reduced cost is displayed in the building menu). Two GvG rankings exist: guild ranking, and map ranking. The guild ranking is global and determined by the amount of prestige points a guild has, which your guild can gain from the level bonuses obtained while leveling up your guild. Provinces also have their own map ranking, which is ordered by guilds' power gained in that province map. Getting to the top of the map ranking will not only increase your guild's fame and notoriety, but it also provides its own benefits. Unlocking a defending army slot. As your guild conquers and expands its territory, goods cost rise. Your whole guild may need to contribute goods to pay for new army deployment and unlock defense slots, and this is where the guild treasury comes in. When you attempt to place an army, you are first taken to the unlock screen, where you can contribute to - your guild's treasury. In the image below, 30 iron and cloth are required, and as you can see that they are already available in your guild treasury, because the number is shown in green. Also needed are ebony, jewelry and limestone, which the guild need to collect and pay in order to unlock this slot. Buttons beside the good requirement show what you as a player are able to contribute: in this case, 15 jewelry and 15 limestone. And you could also use Diamonds to purchase ebony for your guild. Only when all required goods are available can the slot be unlocked. 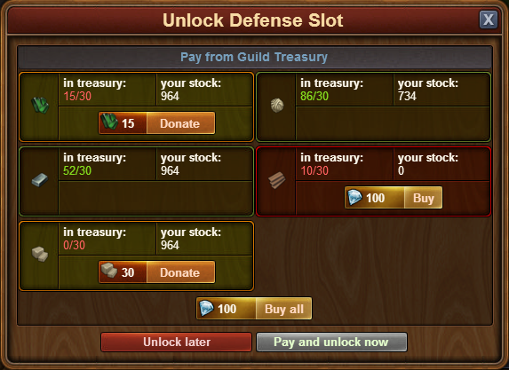 You can also donate goods to your guild's treasury whenever you feel like it in the Treasury screen. Attack protection - After conquering a sector, it cannot be attacked until the next daily calculation. Also, unless it is a HQ, this sector does not count for placing siege armies and attacking until the next daily calculation. Average power - The average power of a sector in the province. Besieged, under siege - A sector that holds a siege army. Besieged sectors do not produce power, and most actions are blocked (like placing a defending army, relocate HQ or grant freedom). Construction Rebate - According to the level of the guild, all guild members get a discount on the coins and supply costs of their buildings. Coordinates - A unique identifier for every sector on the province map. Daily Calculation - At the end of every day, during the daily calculation, power is paid out, and attack protection is lifted. Defending Army - A sector can hold up to 8 defending armies. If the sector gets attacked, each of these armies has to be defeated 10 times. Grant Freedom - When a guild “grants freedom” to one of their sectors, it and all defending armies in it will become controlled by an NPC again. The guild will gain a few goods for doing so. Guild Continent Map - The map in which the provinces are located. Entering GvG will lead you there. Guild Level - The accumulated power of the maps will contribute to the guild level. Whenever enough points are gathered, the guild levels up and unlocks bonuses for their members. Guild Ranking - A ranking that displays all guilds sorted by their prestige. Guild Treasury - The guild treasury holds goods that are contributed by the players and certain events/actions. The treasury is used to pay goods for unlocking slots or placing siege armies. Guild versus Guild - The official name of the feature is “Guild versus Guild”. Guild’s area - The sectors controlled by a guild in a province. GvG / GVG - Abbreviation for “Guild versus Guild”. Headquarter - The first sector a guild conquers on a map will hold the headquarter. The headquarter can be moved to other sectors. It is important for the distribution of the support bonuses. Also, from a headquarter siege armies can always be placed (there is no 24-hour-protection). HQ - Abbreviation for headquarter. Landing Zone - A defined area of sectors in every province in which new guilds entering the map can start and place their initial siege army. Map Ranking - Every province has a map ranking that displays the guilds sorted according to their daily power. NPC - “Non-playing character” – if a sector is not controlled by a guild, it is controlled by a NPC instead. Owner - Either the guild or the NPCs name of whoever owns that sector. Power - A sector produces power during the daily calculation for the guild that owns the sector. Prestige Bonus - According to the level of the guild, every day the guild will get a certain amount of prestige. 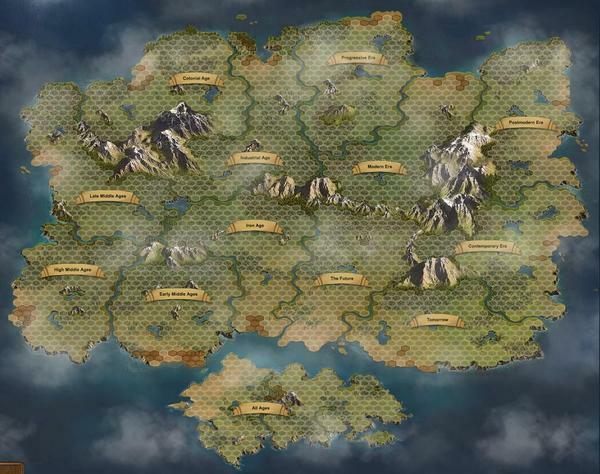 Province - The guild continent map holds the provinces in which the guilds fight. There is one province for each age, meaning only units and goods from that age are used. Province’s age - The age of a province; according to our normal ages in the game. In a province, only goods and units from the province’s age can be used. Recruitment Boost - According to the level of the guild, the recruitment and healing times of units are reduced for all guild members. Relocate Headquarter - A guild can relocate its headquarter; effectively, the headquarter gets put on to another sector of their territory, as long as neither of the two sectors is under siege. Research Boost - According to the level of the guild, all guild members receive - Every province holds a large number of sectors. Guilds battle for control of these sectors. A sector provides power. Siege Army - One member of a guild has to place a siege army on an enemy sector first. Placing a siege army requires goods. Only after placing the siege army the defending armies in that sector can be attacked by members of the guild. Note that the siege army itself does not attack, but it can be attacked and defeated. Support Bonus - All defending armies in a guild’s sector or a siege army can get a buff. That buff is called “support bonus”. It is calculated from the support pool, the support factor and the distance to the headquarter. Support Pool - All guild members contribute with certain buildings to the guild’s support pool. The support pool and the support factor of a province define the total support bonus for the guild in that province. Support Pool Bonus - According to the level of the guild, the guild’s support pool is increased. Unlock - Opening up another slot for a defending army (up to 8 in total). This action requires goods. Unlocked Slot - A slot that was unlocked and can take a defending army now.